Jumping the sinking sat nav ship? TomTom has announced it is providing the mapping data for Apple's new operating system, which was unveiled at WWDC this week. 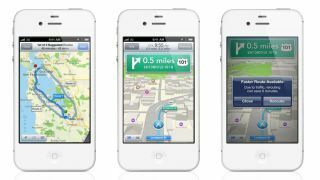 Apple has shunned Google in its next iteration of its mobile platform, with a brand new mapping solution coming with iOS 6. Engadget initially reported the possible partnership between Apple and TomTom, before receiving the following statement from the sat nav manufacturer: "TomTom has signed a global agreement with Apple for maps and related information." The end of in-car sat navs? The move by Apple to provide its own mapping software, along with turn-by-turn navigation, sees it follow in the footsteps of Google's successful offering on Android handsets. However with more and more people now getting free access to navigation software on their phones, has TomTom seen the opportunity to ditch dedicated devices in favour of handset based solutions? We've contacted TomTom to see where they expect the business to go, and we'll update this article once we hear back.